General Mills brand has long partnered with the National Parks Conservation Association (NCPA), but in 2018 it took to the street for a guerilla-style campaign. Parklets were conceived in San Francisco 12 years ago, but has turned into a global movement. Brand-building company Oliver Russell recently brought experiential marketing to Nature Valley with their “Parklet” campaign. The popular General Mills brand has long partnered with the National Parks Conservation Association (NCPA), but in 2018 it took to the street for a guerilla-style marketing campaign. “Parklets” popped up in Portland, Oregon, Boise, Idaho, Seattle, Washington, and San Francisco, California on September 15th. The experience coincided with National Park(ing) Day, a yearly event that encourages businesses, artists, activists and the community to turn parking spots into tiny, pop-up public parks. This idea was conceived in San Francisco 12 years ago, but has turned into a global movement. It’s a way to turn otherwise urban spaces into miniature spots of paradise. For Nature Valley, this aligned perfectly with their brand and mission of getting healthy and getting outdoors. Who says you have to live in a rural area to make this happen? "...we know experiences are important for consumers"
For this campaign, Nature Valley reached out to branding company Oliver Russell for the Boise parklet to help execute the experience. Oliver Russell shared the approach with AnyRoad, detailing what it took to pull off a huge, multi-city event. Each “activation” happened in just one parking lot, all of which were situated in city centers. This helped keep things a little more manageable. Each site was also created to be wholly unique and an homage to the city. For example, in Portland (one of the most bike-friendly cities in the country), cyclists could take a break and relax on a porch swing. The swing was donated to an area school after the event. 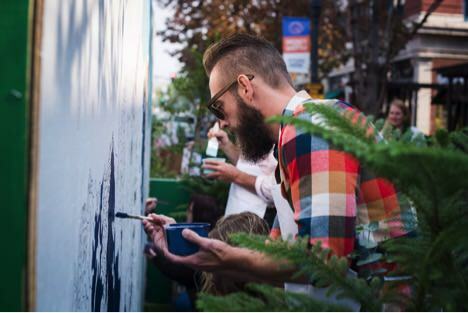 Boise let passerby pick up a brush and become part of a huge paint-by-number mural. Sure there were granola bars available, but sampling wasn’t at the heart of this campaign. Experiential marketing manager at Nature Valley, Josh Arnold, says, “Our main goal was to bring a unique take on nature to consumers where they least expected it.” In total, over 6,000 people stopped by the parklets and led to over 400,000 impressions. According to Oliver Russell leaders, they only had three weeks to prepare for the Boise pop-up campaign. Nature Valley gave Oliver Russell total control of what the mini parks could be, knowing that they would have to be torn down in the evening. That was three weeks from initial concept to gaining approval to design and set-up. It was a challenging whirlwind, and one Oliver Russell wholly embraced. The paint-by-numbers mural concept by Oliver Russel is a nod to nostalgia. It features the Sawtooth Mountains and gave the community a way to engage with Nature Valley, the outdoors, and each other. Bringing the concept to life required getting approval from the City of Boise, numerous mockups, and plenty of late nights tracing the mural. Everything was planned perfectly, but on the big day there was one small stumble: Nobody realized a beer delivery to a local, popular Boise restaurant was scheduled during setup. However, it all came together in a mad dash and passerby were painting by 10 in the morning. Many returned throughout the day to see how the project was shaping up. They took a personal, vested interest in it. In total, over 170 people contributed and more than 200 Nature Valley bars were passed out. News about the partnership between Nature Valley and National Parks Conservation Association was shared, and Oliver Russell employees helped to finish the lingering blank spaces at the end of the event.